The border collie is a medium-sized dog that is very athletic, highly intelligent, and has loads of energy. This breed is extremely driven, loyal, and hard-working. A happy border collie is a working or playing border collie. Colors: May be solid color, bicolor, tricolor, merle, or sable. Usually seen in black, blue, blue merle, brindle, gold, lilac, red, or red merle (with or without patches of white). 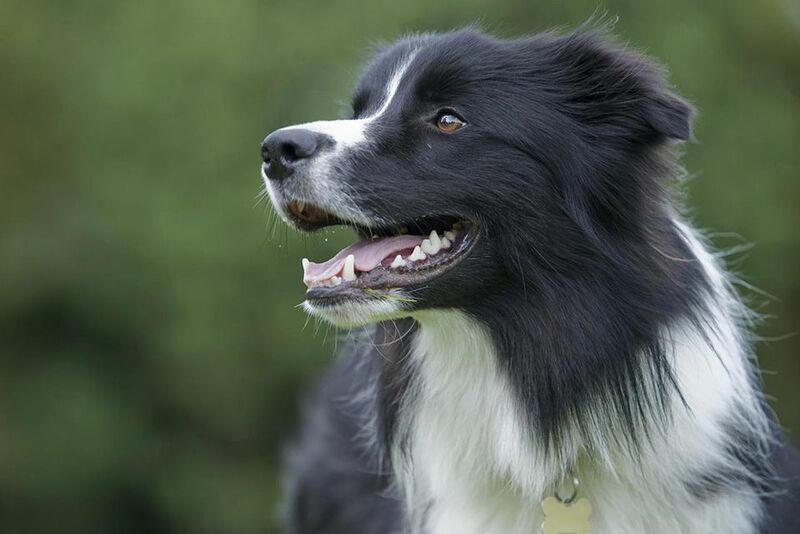 The border collie originates from sheepdogs on the British Isles and was developed on the border of England and Scotland (after which it was eventually named). The border collie has remained true to its origins as a hardy, diligent, working dog. In the mid-1800s, Queen Victoria became quite fond of the breed and likely contributed to its legacy as the ideal sheep-herding dog breed. Over the years, the border collie has upheld its reputation as a highly intelligent worker. The breed was brought to the sheep ranches of Australia and New Zealand in the past century. Border collies have been highly successful at herding, agility, Frisbee, and many other activities. The border collie was officially recognized by the AKC in 1995. The border collie may have either a rough or smooth medium-length double coat with a coarse outer coat and a soft undercoat. They should be groomed routinely. Regular weekly brushing is important to keep the coat tangle-free. They only need a bath about every three months. Although active border collies may have naturally worn down nails, it's important to check the nails regularly and trim the nails as needed. This will help keep the feet healthy and comfortable. You should also pay attention to dental hygiene and brush your dog's teeth at least two to three times per week. The border collie is known for its an alert expression, ready-to-go attitude, and strong instincts. The breed is among the smartest of dogs and learns new things with ease. Thorough training is absolutely essential and should not be very difficult. Also, be sure to properly socialize your dog so he will be at ease in all kinds of situations. It's important to understand that border collies are extremely high-energy dogs. This breed needs tons of exercise and plenty of activities to keep the body and mind occupied and in good shape. At a bare minimum, you must be able to provide a long, brisk daily walk (preferably two). You will need to walk on-leash as border collies are prone to chasing cars and bicycles. In a safe area, you can play fetch or Frisbee to work off some of the energy and provide the dog a task to complete. Although they are are superb herding dogs, they also excel in most dog sports, especially agility and disc dog competition. You must find plenty of activities for your border collie if you want him to thrive. This high energy level and need for activity make the breed less suitable for apartment living. It's best to provide a large fenced yard or, even better, a farm or ranch where there is herding work to be done. The border collie tolerates both cold and hot weather fairly well, but you should always provide a comfortable place for your dog out of any extreme conditions. What a border collie won't tolerate is being alone. It's not enough to provide room to roam; your dog needs someone to roam with and something specific to do. When bored, this dog may develop habits such as chasing cars, digging, chewing up furniture, or barking. You may also note typical herding behavior of humans and other pets, nudging and nipping to get them in line. If you are a multi-pet household, this might lead to altercations. Border collies are very sensitive to noise and will alert you to visitors, passersby, and any other movement. They may also be sensitive to sudden loud noises like fireworks and thunder. Collie Eye Anomaly: This is an inherited disease seen in this breed. It usually is mild in border collies and impairs the vision. Breeders can screen for this. A border collie will need two meals a day of 3/4 to 1 cups of dry dog food, depending on the dog's size and activity level. Be sure to provide fresh, clean water. Your dog's nutritional needs will change throughout his lifespan. If you note that your dog is putting on weight, you should discuss this with your veterinarian to develop a plan of action. You may need to change the feeding schedule, type of food, or amount of food. You should also consider whether you are providing enough daily exercise for this naturally highly active dog. If you think the border collie is the right dog for you, make sure you do more research on the breed before you get one. Talk to veterinarians and other pet professionals. Ask for input from other border collie owners, responsible breeders, and rescue organizations. Explore all of the dog breeds. With a little research, you can find the right one to bring home.